By law, Manufacturers cannot sell the same item as NEW once it's been returned. Manufacturer has to repackage the item as Refurbished even though it’s never been used. All of our Brother printers have a 12 Month Manufacturers Warranty. 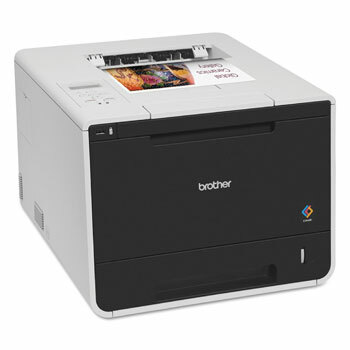 The Brother HL-L8350CDW Color Laser Printer gives you top-notch color printouts. The HL-L8350CDW Laser Printer takes business efficiency to the next level with high color print speeds of up to 30 pages/minute, automatic 2-sided (duplex) printing and wireless network capability. It comes with a 250-sheet standard paper capacity, a high-yield toner cartridge, and moreover, it is mobile print ready. The Brother HL-L8350CDW is a high-speed, wireless output in both color and monochrome. The HL-L8350CDW is designed to do more in less time and save money on every job by reducing your overall printing costs. It features automatic 2-sided (duplex) printing along with high page-yield replacement toner cartridges for maximum output at lower cost. Box Dimensions (LxWxH) 23.0 x 20.5 x 19.5"
Box Dimensions (LxWxH) 23.5 x 22.0 x 21.0"
Dimensions 12.3" x 16.1" x 19.1"